Hello Katie Girl: Unbearably Cute! I've just recently started shopping at Talbot's because I think they've done a wonderful job with their line of clothing for winter. Their clothing is preppy, colorful, and festive, which are three things that I love! When I was a teenager, I remember shopping at Talbot's with my mother and grandmother and thinking that the styles were very dated and "old" looking. I will have to say, however, that over the last year or so, the brand seems more trendy, fun, and youthful, which means the styles can truly be worn by women of all ages. Since this skirt was one of my first purchases from Talbot's, I'll just add a quick note about sizing for any other first time Talbot's shoppers who might be reading this. (This would have been helpful for me before making my first purchase!) The sizing on all of their clothing seems to run a bit large. I bought both this Talbot's skirt and a sweater in my usual J. Crew size and, unfortunately, they were way too big. I had to take the skirt to the store to exchange it for a size smaller. Luckily, the people working at Talbot's were some of the most helpful, friendly sales associates I've ever met. No, this isn't a sponsored post from Talbot's, but I did genuinely enjoy their product offerings and my shopping experience in the store! Your bear skirt is the cutest and looks so good with the Christmas plaid shirt. Great look for the holidays. This reminds me I have a Holiday Sweater from Talbot I bought at the end of the season last year which I MUST WEAR SOON. Talbot has great pieces and great customer service! I found your post on today's link up...and I'm so glad I did! I love your look. What a perfect winter print! 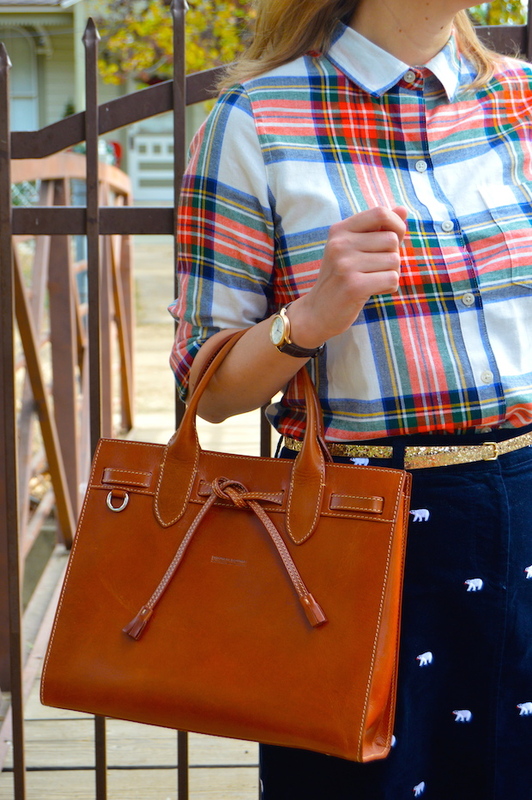 Love this skirt styled with you plaid top, adorable!